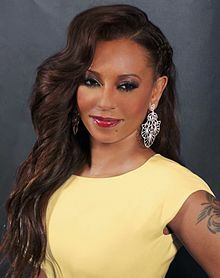 Singer Mel B has suggested the Spice Girls will make their pop comeback by performing at Prince Harry and Meghan Markle's royal wedding in May. The Wannabe hitmakers, comprised of Mel B, Mel C, Victoria Beckham, Geri Horner, and Emma Bunton, have been trying to work out plans for an official reunion ever since all five members of the girl group gathered for discussions earlier this month. On Monday (February 26), Geri, who hosted the shock meeting at her English home, claimed efforts had stalled as they all have "different priorities", but on Tuesday (February 27), Mel B confirmed they will appear in public as a band on May 19, when Harry and Meghan tie the knot at Windsor Castle. The pop star and TV personality let slip the news while serving as a guest co-host on Los Angeles-based talk show The Real, and confirmed they had been invited to the high-profile event. Asked if she knew of anyone going to the wedding, Mel nodded and mouthed, "Yeah, I'm going." As co-presenters Loni Love, Jeannie Mai, and Adrienne Bailon squealed in excitement, Scary Spice quipped, "I'm not sure if I should have said that!" Mai then asked if Mel B had received an actual invitation, to which she replied, "Us five Spice Girls," before remarking, "Why am I so honest?" "It was proper," she simply shared of the wedding invites, after declining to describe them in detail. "I'm not saying any more. I've said enough!" However, when quizzed directly about whether the Spice Girls would be performing at the royal reception, Mel bowed her head and said, "Ugh, I swear, I'm just like (spilling everything)...," as Loni, Jeannie, and Adrienne took her reaction as a yes and celebrated the news. While Mel didn't give an affirmative answer, she realised she had already shared too much. "I need to go... I'm gonna be fired!" she exclaimed. It remains to be seen if the Spice Girls will actually be providing the entertainment for Harry and Meghan's big day, but it won't be the first royal wedding for Victoria - she and her soccer star husband David Beckham also scored invites to the 2011 nuptials of Prince William, Harry's big brother, as he wed Catherine, Duchess of Cambridge.